Yellowbrick generates visualizations by wrapping matplotlib, the most prominent Python scientific visualization library. Because of this, Yellowbrick is able to generate publication-ready images for a variety of GUI backends, image formats, and Jupyter notebooks. Yellowbrick strives to provide well-styled visual diagnostic tools and complete information. However, to customize figures or roll your own visualizers, a strong background in using matplotlib is required. 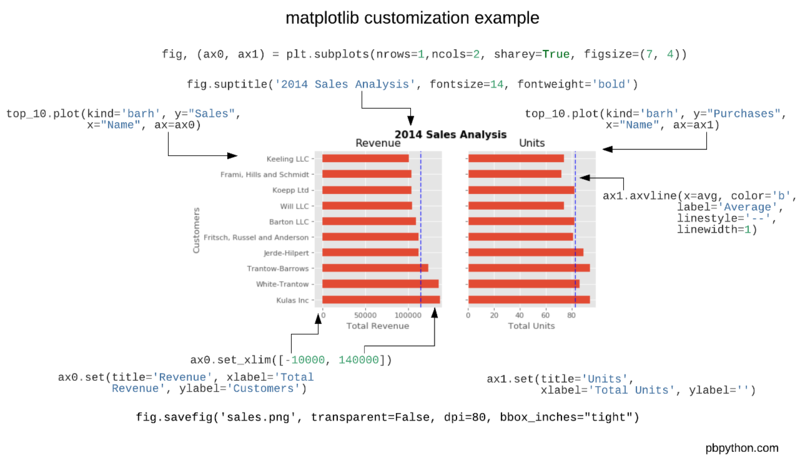 With permission, we have included part of Chris Moffitt’s Effectively Using Matplotlib as a crash course into Matplotlib terminology and usage. For a complete example, please visit his excellent post on creating a visual sales analysis! This post was also adapated for matplotlib’s documentation, The Lifecycle of a Plot, which gives another good perspective. 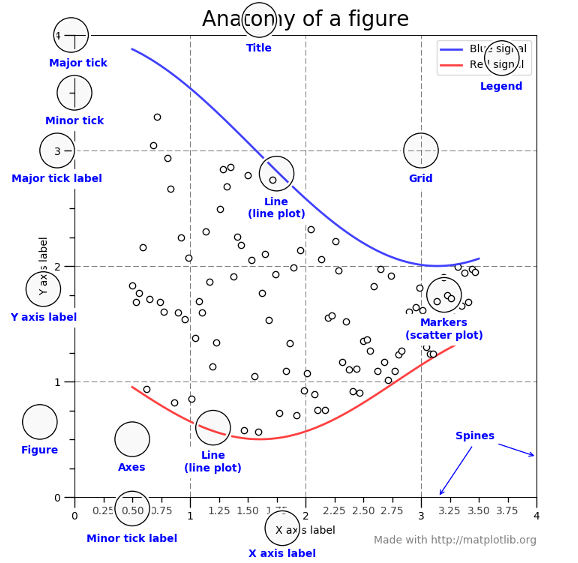 Additionally we recommend Nicolas P. Rougier’s Matplotlib tutorial for an in-depth dive. This graphic from the matplotlib faq is gold. Keep it handy to understand the different terminology of a plot. Most of the terms are straightforward but the main thing to remember is that the Figure is the final image that may contain 1 or more axes. The Axes represent an individual plot. Once you understand what these are and how to access them through the object oriented API, the rest of the process starts to fall into place. The other benefit of this knowledge is that you have a starting point when you see things on the web. If you take the time to understand this point, the rest of the matplotlib API will start to make sense. Therefore you have complete control of the style and customization of a Yellowbrick visualizer. The reason I recommend using pandas plotting first is that it is a quick and easy way to prototype your visualization. Since most people are probably already doing some level of data manipulation/analysis in pandas as a first step, go ahead and use the basic plots to get started. The resulting plot looks exactly the same as the original but we added an additional call to plt.subplots() and passed the ax to the plotting function. Why should you do this? Remember when I said it is critical to get access to the axes and figures in matplotlib? That’s what we have accomplished here. Any future customization will be done via the ax or fig objects. We have the benefit of a quick plot from pandas but access to all the power from matplotlib now. An example should show what we can do now. Also, by using this naming convention, it is fairly straightforward to adapt others’ solutions to your unique needs. There are plenty of things you probably want to do to clean up this plot. 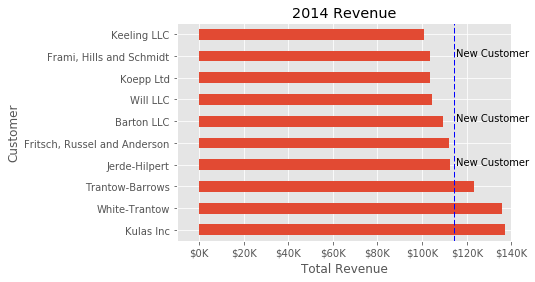 One of the biggest eye sores is the formatting of the Total Revenue numbers. Matplotlib can help us with this through the use of the FuncFormatter . This versatile function can apply a user defined function to a value and return a nicely formatted string to place on the axis. That’s much nicer and shows a good example of the flexibility to define your own solution to the problem. The final customization feature I will go through is the ability to add annotations to the plot. In order to draw a vertical line, you can use ax.axvline() and to add custom text, you can use ax.text(). For this example, we’ll draw a line showing an average and include labels showing three new customers. Here is the full code with comments to pull it all together. While this may not be the most exciting plot it does show how much power you have when following this approach. Up until now, all the changes we have made have been with the individual plot. Fortunately, we also have the ability to add multiple plots on a figure as well as save the entire figure using various options. In this example, I’m using nrows and ncols to specify the size because this is very clear to the new user. In sample code you will frequently just see variables like 1,2. I think using the named parameters is a little easier to interpret later on when you’re looking at your code. I am also using sharey=True so that the y-axis will share the same labels. This example is also kind of nifty because the various axes get unpacked to ax0 and ax1. Now that we have these axes, you can plot them like the examples above but put one plot on ax0 and the other on ax1. This version saves the plot as a png with opaque background. I have also specified the dpi and bbox_inches=”tight” in order to minimize excess white space. © Copyright 2016-2019, The scikit-yb developers. Revision d223c05a.